The Protection Sports Association (PSA) was conceived and born in 2001 and last year celebrated its 15th anniversary in October of 2011 at the National Championship weekend held in Westford, MA. The sport was the founded by Jerry Bradshaw of Tarheel Canine Training, Incand Joe Morris, late of Capital Cities K9 in Baltimore, MD. PSA hosts trials, seminars, regional and national competitions during a trial season that starts in January and runs through the National Championship in October. There are four regions: West, Midwest, East, and Canada, each with a director, and 2 assistant directors in each region. The regional directors approve club trials, host the regional events, and oversee the competitions. Judges are available to travel to events by invitation of the hosting clubs. The mission of the organization is to provide a competitive outlet for obedience and protection training in a scenario-based program of dog sport. There is a mandatory entry level certificate, called a PDC, that must be achieved by all competitors before going on to the competitive levels of PSA 1 through PSA 3. Protection dogs should be reliable and clearheaded when doing there job. A good trained protection dog should be able to do his job everywhere and protect our beloved kids even when we are not paying attention.. In each successive level the dog-handler team is asked to negotiate obedience and protection routines that are increasingly complex, difficult in terms of pressure from both decoys and environmental distractions, and as well the handlers must strategize how to work through scenarios involving risk-reward tradeoffs. As the scenarios can change from trial to trial in the upper levels, handlers must be able to train components of exercises, and pattern training is a virtual impossibility. The higher the levels, the more surprise scenario components in both obedience and protection are presented to the handlers. under two senior judges as well as the Director of Judges. Decoys working trials are certified by PSA, through regional directors and the PSA Director of Decoys, as knowing the trial routines, being physically fit to perform, and safe to catch the dogs. PSA is a unique sport, and separates itself from other dog sports by having suited decoys on the field during obedience routines in the competition levels of PSA 1 – PSA 3. In the PSA 1 level a decoy in a bite suit sits in a chair during the majority of the routine, and during a recall from a down position, will toss some distractions past the dog in a down before the handler recalls the dog to heel position. In PSA 2, the decoys (multiple) will walk/jog around the dog/handler team and interact with the handler verbally, as well as provide food refusal and distraction during position changes, retrieves, and jumping exercises. The pattern of the obedience in both PSA 1 and PSA 2 is known to the handler. In PSA 3 the obedience routine is drawn up by the judge as a surprise scenario. Skills such as heeling, retrieves, jumping exercises, climbing exercises, food refusal, position changes are known to the handler, but the order of the routine is unknown to the handler until the day of the trial. Heeling is judged strictly even under these distractions. In PSA 3 the decoys on the field run, agitate, while the dog is heeling, staying, and doing motion exercises. It is an extremely challenging environment for handler and dog! In PSA Protection, the PDC and PSA 1 have a hidden sleeve bite during a car-jacking scenario, handler attacks, courage tests (the PSA 1 Courage test is our signature exercise), and in PSA 1 there are 5 possible surprise scenarios of which the judge picks one on trial day, randomly. In PSA there can be hidden sleeve bites in all levels, mandatory in PDC and PSA 1. In PSA 3 there can be muzzle attacks as well. All other encounters are in full bite suits. In PSA 2, there are 4 protection scenarios, 3 of which are known ahead of time to the competitors. There is a 2 decoy courage test, a fended off attack behind a vehicle, a call-off, and one surprise scenario is drawn up by the judge for trial day. In PSA 3, guidelines are provided to the judges to make scenarios for a courage test, call-off, test of environmental stability, and a searching exercise or muzzle attack. Further guidelines within each scenario are also given, but these scenarios are not known to the handlers except in principle until the day of the trial. 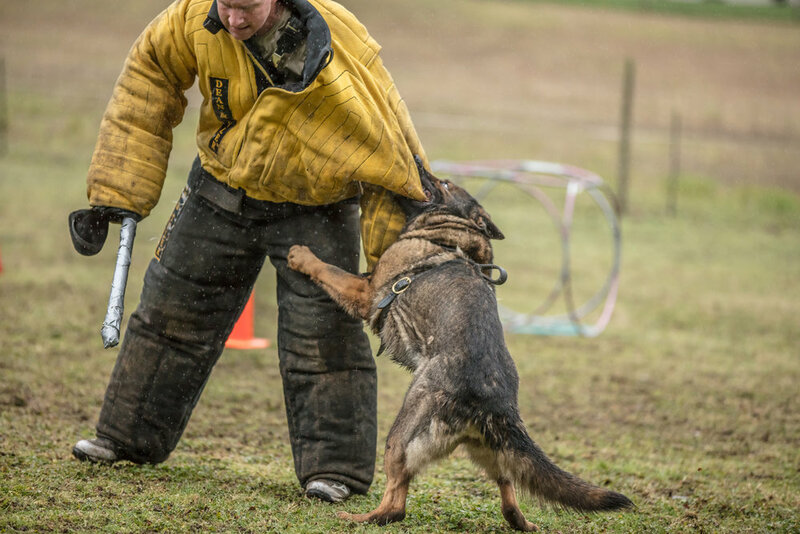 Because of the surprise scenario nature of the trials, and high level of training, many law enforcement K9 teams are giving PSA a try, and PSA encourages cross-over from other protection sports, or from police K9 units to add to the excitement of the sport. Many of our top certified decoys are police K9 handlers and trainers. Because of the difficulty of the routines (you must pass OB and each of the protection routines to pass for the title), teams are competing mainly against the sport and not one another, so there is a sense of camaraderie found in PSA that is unique. To title, a dog/handler team is required to pass one trial in PDC and PSA 1, and teams must pass 2 trials completely to earn titles in PSA 2 and PSA 3.